Artisan Vehicles Makes Good On Its Promise To Deliver A Game Changer. The First 40 Tonne All Battery Powered Haul Truck Is Here. It was one year ago today that Artisan put the mining industry on notice that times are changing with the launch of the first ever battery powered loader built from the ground up around lithium battery technology (the 153). Today, one year later, Artisan showed the world that battery power is not just a promising experiment, but a powerhouse technology that promises to change the mining industry forever. 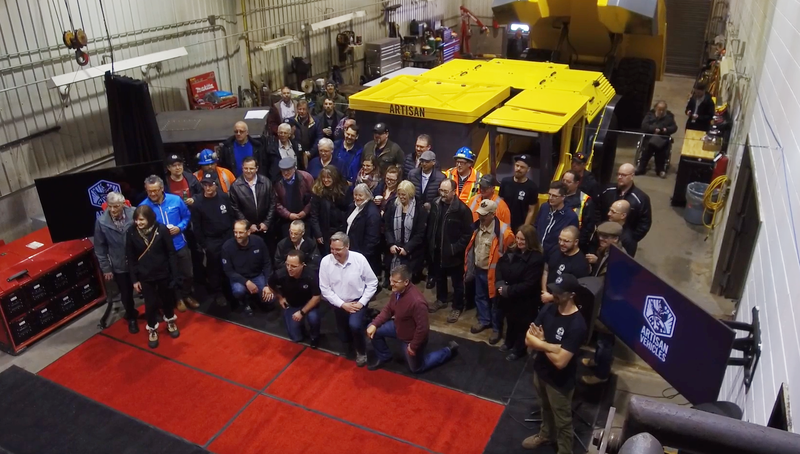 “This first Z40 truck was assembled right here in Kirkland Lake with strong support from the local community and highly capable local vendors.” said Mike Mayhew Director, Mining for Artisan. “We are both impressed and thankful for how the local community has stepped up and is supporting our company and our mission”. The Z40 Haul Truck ushers in a new era in underground hard rock mining. With its Artisan all-electric battery powered drive system, the Z40 has almost twice the peak horsepower of a comparable diesel machine. It is the smallest 40 tonne truck on the market. It produces zero poisonous diesel emissions and it generates only 1/8th the heat of its diesel equivalent. Artisan has optimized the recharging process to ensure that the Z40 will outperform its rivals on tonnes hauled per day. The Z40 reduces demand on the mine’s ventilation and cooling systems. It enables deep mining. It improves working conditions and creates a healthier environment for everyone underground. Your company has chosen a great town to set up shop..
glad to see this type of huge investment being made in the north. this is fantastic news for northern Ontario and a major step forward in battery operated vehicle technology. We at The Bucket Shop are very excited that we were selected to manufacture the truck body for the new Z40 truck. Congratulations to everyone involved in the concept, design and production of this vehicle and your ongoing products. Within my travels and clients, I will commit to spreading the news. Excellent news! Whenever I hear a fully powered battery vehicle I hear good news.